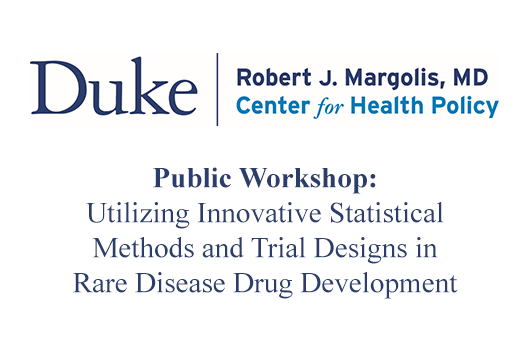 Convened by the Duke-Robert J. Margolis, MD, Center for Health Policy at Duke University and supported by a cooperative agreement with FDA, this public event will bring the stakeholder community together to discuss the challenges that rare disease settings pose for treatment development and regulatory decision-making, as well as the promising study designs and analytical methods that can help overcome them. The day's discussion will center around novel approaches to trial design and analysis to improve efficiency and interpretability of results in rare disease trials. Rare disease settings pose a number of significant challenges for clinical research, drug development, and regulatory review. Small population sizes, sometimes limited scientific understanding of the disease of interest, and misaligned policy or market incentives often preclude more traditional clinical trial or analytical approaches from being pursued. To help collaboratively address these barriers, FDA is working with stakeholders to solicit feedback on promising designs and methodologies that could form the basis of formal guidance documents. During the course of the public workshop, speakers and participants will discuss a range of tools and methods that could be used in the development of treatments for rare diseases and small patient populations. The meeting will include both presentations by panelists and dedicated time for questions and comments from attendees.